Are you looking for something a little different this year? Are you bored of the same annual Christmas tree decorations? 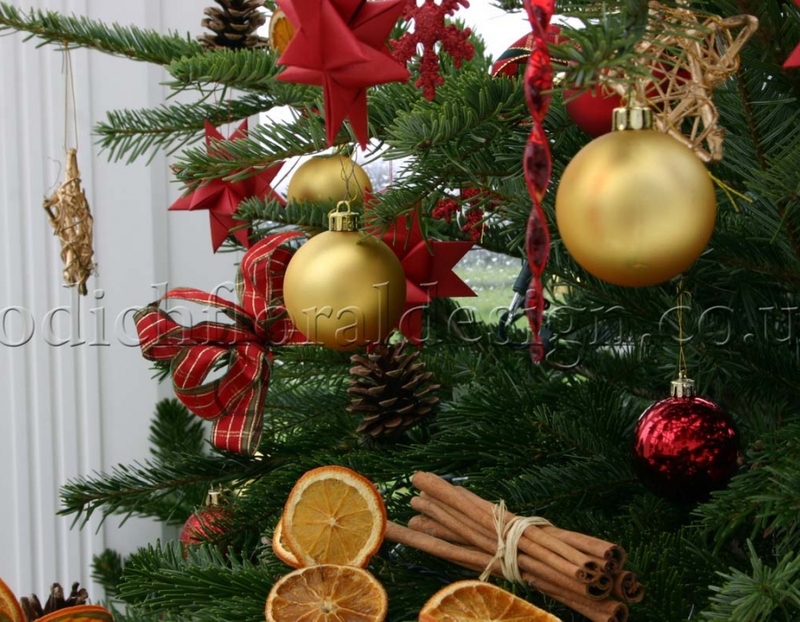 Decorated Christmas trees (with delivery in London!) 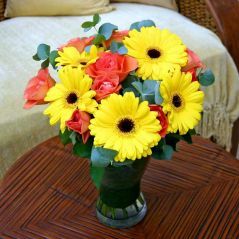 are one of our specialities, along with envisioning a stunning array of interior and home decor ideas. As an early gift, we have put together a guide of this year’s most sought-after Christmas tree colour schemes. 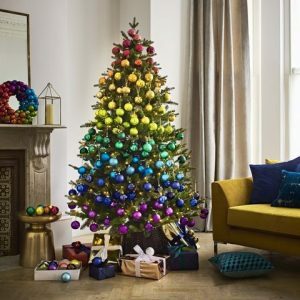 One of the most talked about colour schemes of 2018 is the Rainbow Christmas tree. Taking a step away from the more traditional designs, the rainbow tree will really brighten up any room that it’s in. This is thanks to the fact that each section of the tree is a different colour of the rainbow! 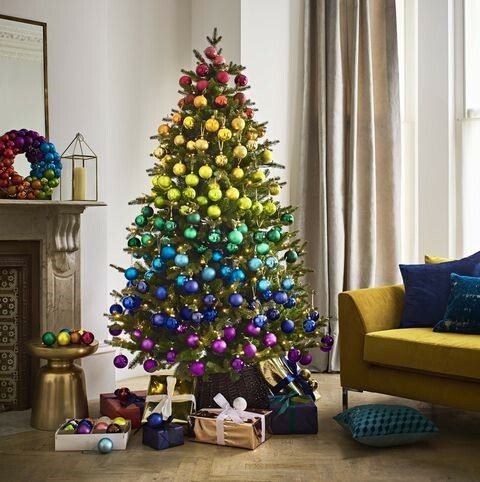 John Lewis revealed that the Rainbow tree will be the biggest trend of 2018 and have rolled out decorations and bauble collections to match. In absolute contrast, another trend that will be in this year is the traditional ever-green Christmas tree with simple decorative lights. The lights can of course be experimented with, but warm white is always a favourite and a safe option. These lights will show off the rich greens of the tree and will add warmth to the surrounding area. Other options are the cool white lights that offer crisper icier atmosphere. 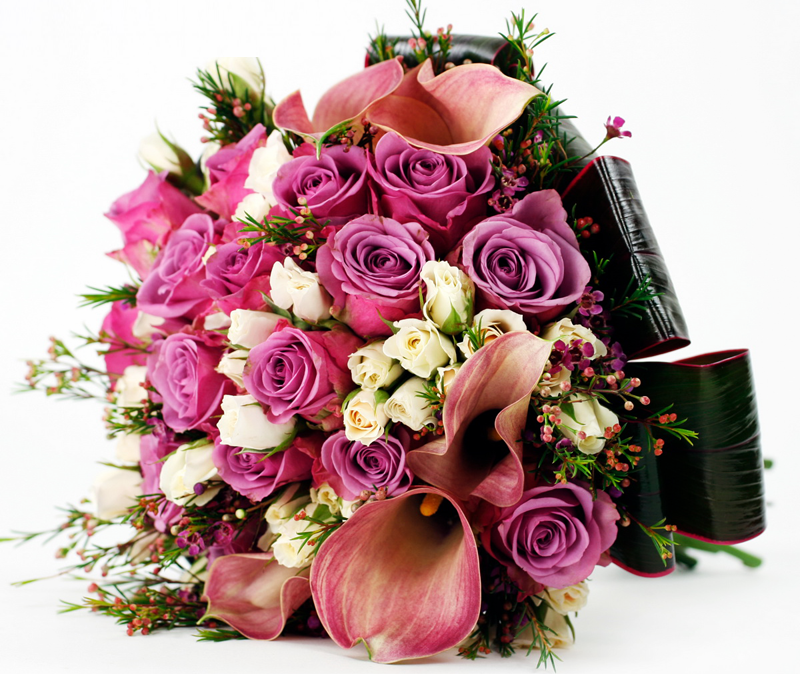 Conversely coloured or multi-coloured lights will offer a totally different ambiance. Another classic tree design is the Evergreen Woodland. This tree makes the most of the woodland colours, mixing the rich greens with warm browns and reds. This design will keep this year’s tree looking natural, as it would still look right at home in the ever-green pine wood forest that it came from. Great Christmas decorations to match include pine cones, acorns and anything wooden. A great activity for children leading up to Christmas would be adding glitter and subtle decoration to natural items such as the acorns and pine cones. As shown in this Elle Decor article, blue is in! The Blue Christmas tree is in fact extremely versatile and can create numerous Christmas moods. As the image at the end of the link shows, this scheme can range from an icy blue option, which is an updated more colourful version of the ice white Christmas tree, to a rich royal blue or a crisp sapphire. This option brings a pop of colour to the home but doesn’t overdo it. Taking inspiration from the preceding season, the Autumnal Amber Christmas tree will warm up any room. Its fiery flare will come from an abundance of different copper shades. Leading on from the success of the rose gold option that was a 2017 favourite, this warm earthy addition is set to be a 2018 must have. This design again looks great with spiced up autumn leaves, acorns, pine cones, wreaths and wooden decorations. As the countdown to Christmas begins make sure you are prepared. 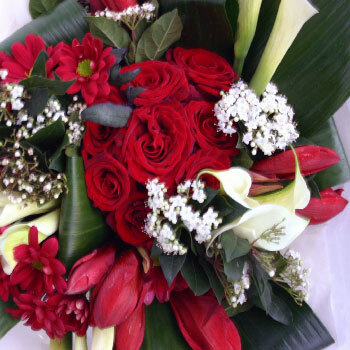 If you would like to use any of our services, office flowers or would like to find out more, please contact us.